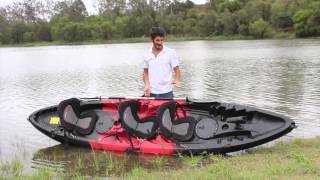 The Dragon Kayak 2.5 Seater Family fishing Kayak is arguably the best family fishing kayak on the market today. Designed in Australia, it’s built for stability, safety, tracking, comfort, elegance, and versatility. The Dragon family kayak is also known to many as the double kayak, tandem kayak or the recreational kayak. 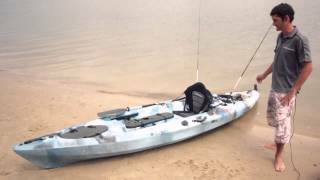 The Dragon family fishing kayak is fully rigged with all the bells and whistles. Featuring deluxe fishing seats, swivel rod holders, built in rods holders and easy to use lightweight paddles. The Dragon family Kayak features an addition 3rd seating position. The Dragon family kayak can be paddled by couples, or by a single person. Dragon family kayak is one of a few kayaks on the Australian market that has been tested and certified by an Australian compliance and safety firm for specification and weight capacity. The engineered Bow and Stern design enhances manoeuvrability, tracking and speed. The streamlined hull improves aquaplaning to reduced water resistance. The Dragon family kayak is also an excellent recreational kayak for couple that are looking for a tandem kayak or double kayak as all the fishing rod holders can be easily removed.